Instructions: Card size is 5 x 7". Cut Pearl White Metallic cardstock to 10 x 7", score at 5" on the long side and fold. Cut another piece of Pearl white cardstock 5 7/8" x 6 7/8" and adhere to the card base with dimensional tape. Diecut the Eyelet Lace Frames from Pearl White Metallic cardstock. Adhere the large frame to the white mat layer using mini dimensional dots. Diecut the large border again from the Lush Lilac Paper Collection and use only the negative piece from the center. Adhere to the base as shown using dries clear adhesive. Adhere the small frame to the designer paper using dries clear adhesive. 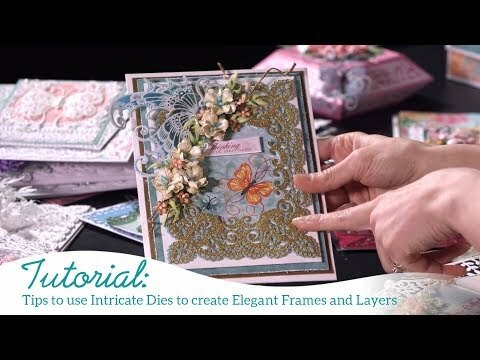 Stamp the sentiment onto the center diecut using Concord ink and adhere to the center of the small frame using dimensional tape. Stamp the Large and small Camelia Carnations on white cardstock using Concord ink. Color with the Concord and Lilac Posies inks. 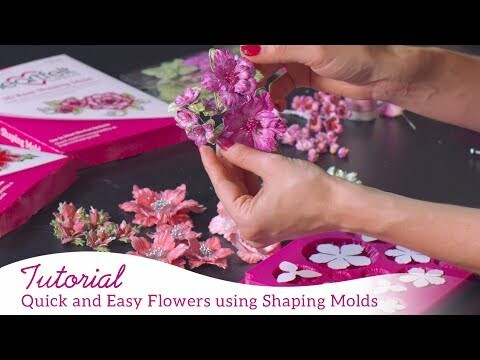 Place the petals in the Floral Basics Mold, mist with water and run through the die cutting machine. While still wet, pinch all the petals to get a nice ruffled effect. Use the Deluxe Flower shaping tools to finish shaping the carnations. See the video for more instruction. Stamp the Classic Rose Vines on white cardstock using Brilliance Pearlescent Ivy ink, diecut with the coordinating die. Color with Pearlescent Ivy and Lilac Posies inks and shape using the Deluxe Flower Shaping Kit. Using a sponge and dries clear adhesive, add Crystal Clear Glitter to the flowers and Leaves. Adhere the Carnations and the Leaves to the card base using a hot glue gun.